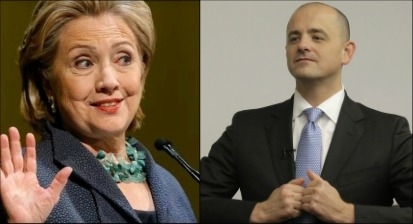 Hillary Clinton (left) has padded her lead atop the Middle East Forum's list of the top ten recipients of Islamist money for 2015-2016, while Evan McMullin (right) has vaulted to sixth place. PHILADELPHIA – Oct. 28, 2016 – The Middle East Forum's "Islamist Money in Politics" (IMIP) project has recorded an additional $12,061 in campaign contributions from Islamist sources to Hillary Clinton since releasing its list of the top ten recipients of Islamist money for 2015-2016 on October 20. The new figures come from just-released FEC filings from August and September. Mrs. Clinton has padded her lead atop the list, accepting $53,226 from prominent Islamists. This includes $16,216 from individuals associated with the Muslim Public Affairs Council (MPAC), a group with deep ties to the Muslim Brotherhood. MPAC's current president, Salam al-Marayati, was kicked off a congressional commission in 1999 when his defense of terrorist groups came to light. Presidential candidate Evan McMullin has vaulted to sixth place on the list, accepting $5,400 from Islamists in August and September. Among other current presidential candidates, Jill Stein has accepted $250; Donald Trump and Gary Johnson have not received any Islamist money. For full details of all Islamist contributions in a sortable database, click here. While the amounts of Islamist donations are relatively small, the information: (1) holds politicians accountable for accepting funds from soiled sources; (2) signals the Islamist lobby's affections and intentions; and (3) tells voters who takes money from individuals linked to enemies of the United States and its allies. Islamists – be they violent or lawful – seek a caliphate and imposition of Shari'a law. This is what Khomeini, Bin Laden, and ISIS believe in. Islamist Money in Politics shines a light on Islamist influence in U.S. politics by making public the campaign contributions of 1,356 leading figures in America's most important Islamist groups. To date, IMIP has documented 3,005 Islamist contributions worth $1.45 million. Launched in 2014, the non-partisan project continually updates contribution data to educate politicians themselves and the public.